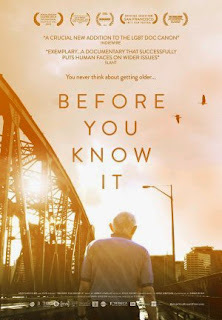 Plot: The subjects of Before You Know It are no ordinary senior citizens. They are go-go booted bar-hoppers, love struck activists, troublemaking baton twirlers, late night Internet cruisers, seasoned renegades and bold adventurers. They are also among the estimated 2.4 million lesbian, gay and bisexual Americans over the age of 55 in the United States, many of whom face heightened levels of discrimination, neglect and exclusion. But Before is not a film about cold statistics and gloomy realities, it’s a film about generational trailblazers who have surmounted prejudice and defied expectation to form communities of strength, renewal and camaraderie—whether these communities be affable senior living facilities, lively activist enclaves or wacky queer bars brimming with glittered trinkets and colorful drag queens.